The strength of our fence comes from H-braces, an assembly of three posts and a wire which creates a strong resistance to the lateral force of the fence. This is important, because each strand of smooth wire transmits about 150 pounds of pressure to the corner posts, and the woven wire causes 300 pounds or more of strain. There are other ways to brace a fence, but many of them don’t age well and some are harder to construct. Driving around Oregon gives you plenty of examples of badly installed fences. If I had really hard soil, I might consider the floating brace. Otherwise, the H-brace is the way to go. I was going to discuss the mechanics of an H-brace, but I found a blog post that provides a good overview without being boring like I would. There are a few important rules of thumb to remember when designing H-braces. The cross brace length should be 2.5 times it’s height above ground. 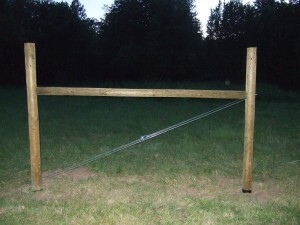 Many people put the cross brace at the top of the vertical posts, but for a 4 foot fence this requires a 10 foot brace. Since 8 foot posts are cheaper, you should put the cross brace 3 to 3.5 foot above ground and rely on the strength of the vertical posts to support the top of the fence. Also, try to place the cross brace where it won’t interfere with line wires. 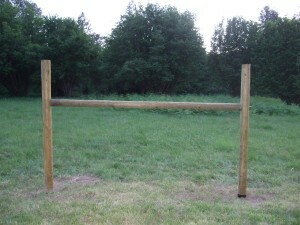 For our garden fence (84″) I placed the posts at 59″ above the ground. For my 10′ cross braces, this only gives me a ratio of 2.0, but I was also trying to site it to avoid the high tensile wires and woven. 12′ cross braces would have been better, but they were spendy and harder to transport. Anyway, too much talking. This is supposed to be a picture post about installing an H-brace. When we left off in the last post, we had installed our corner and brace posts and pinned the cross brace. 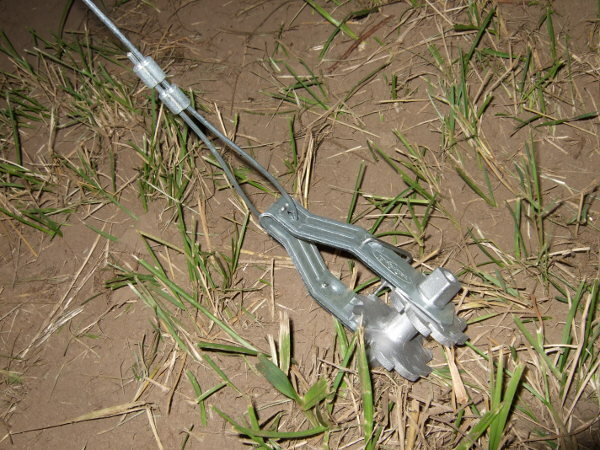 The brace post had the tail of it’s brace pin sticking about an inch out and facing “down” the fence line. 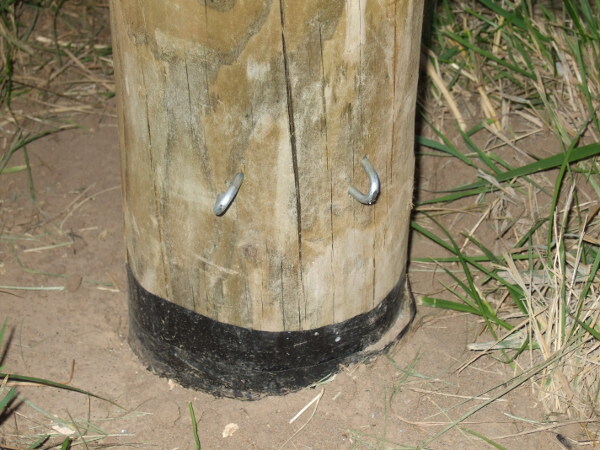 First step is to drive two staples about 5 inches above ground level on the back side of the corner post. Leave these well out of the wood. You will be threading two wires through them. Next, pull off 12.5 gauge high tensile smooth wire from your spinning jenny to create two complete loops around the posts. Thread the wire through the staples at the bottom of the corner post and over the pin at the top of the brace post. Some people cross the wire to form a figure eight. I’m going to have high tensile hot wires tied off at the corners and running through that air space, so I kept the loops straight. High tensile smooth wire has a breaking strength of 1700 pounds. Two loops should double that number. If using a ratchet to tighten the wire like I am, be sure it ends up on the inside of the fence (away from the woven wire). I also made sure that my end wire was going “downhill”, but that’s only because I’m a little OCD. 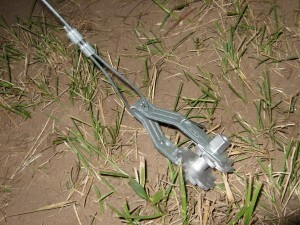 Slide two crimps onto the wire end you’ve been pulling, then add a strainer ratchet. I suggest buying your crimps and crimping tool from Kencove online. Local farm stores will hit you for 5x or more the price. Ratchets are best purchased at Premier1Supplies online. They are about 2.5x more expensive at farm stores. Crimp the two crimps. This is also called “swagging”. Who knew? Check that you have sufficient slack and then cut the wire off the spinning jenny. Thread the newly cut end into the ratchet. 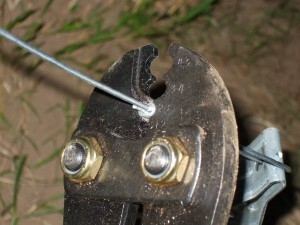 About 1/4″ or less should poke out of the hole, then twist the wire around the ratchet and crank it a bit. 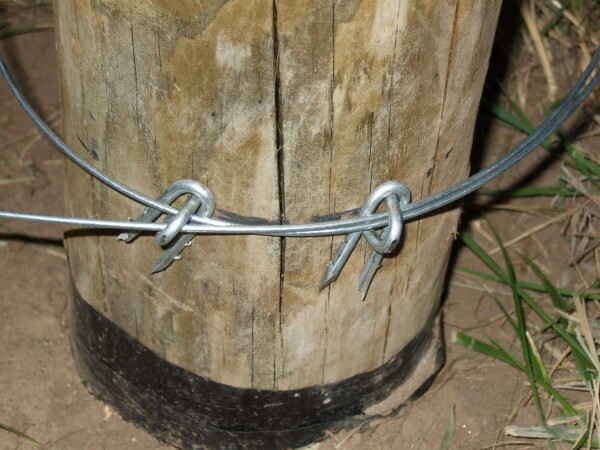 Before you get too carried away, drop two staples over the staples and behind the wire loops at the bottom of the corner post. 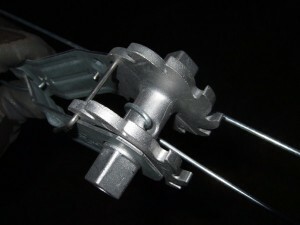 This reduces friction so you can equalize the tension on the loops. Crank the ratchet to tighten the H-brace. I probably overtightened mine when I first installed them. My recommentation is to bring them up good and snug, but don’t really tighten them until you start pulling wire on the fence. Otherwise you can lean over your braces with this cross wire and nothing to counterbalance it. Some sources suggest tightening until one of the posts moves a 1/4″. I think this is probably bad advice. Here’s what my completed H-brace looked like. Sometimes you see H-braces with two cross wires in an X pattern. 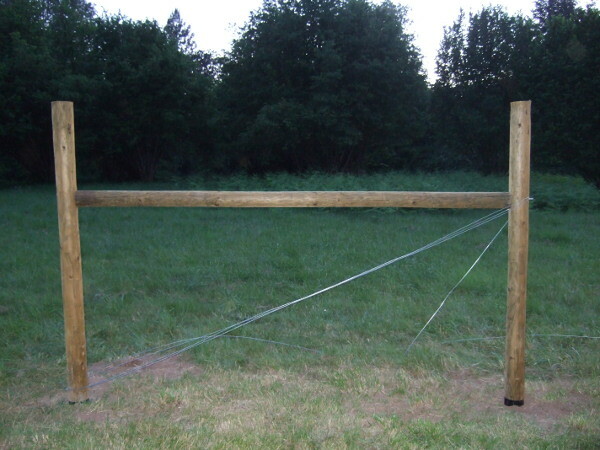 There are only two reasons to do this: for an inline H-brace in the middle of a long fence and for a corner post that will also support a gate. 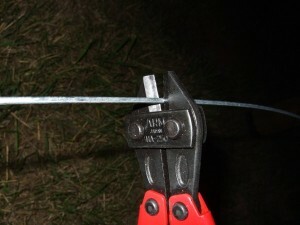 Otherwise, the second wire actually works against the brace, adding it’s strain to that of the fence wire and causing earlier failure. This entry was posted in Farm Structures. Bookmark the permalink. I don’t really have an answer for this. Is this to hire someone to do the work? Are they installing H-braces on both sides of the gate? (You would technically only need an H-brace on the hinge side, unless you are going to have a fence pulled in both directions. The answer would depend on the price of materials and labor in your area. Around here, two H-braces and a galvanized gate would cost less than half that in materials. Im just wondering why my brace wire is snapping when I crank it tight. Any ideas? Im cranking it with a cranking tool and when I get it snug the wire snaps! 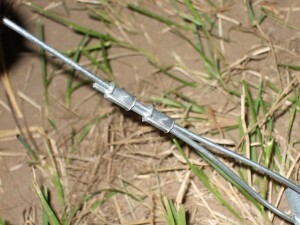 The wire is ht 12 half wire. Thanks for any help you can give. 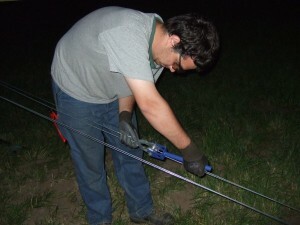 I would guess that there is a defect in your wire–perhaps it was mislabeled as high-tensile? I only crank my H-brace wires until they can resist a reasonable lateral push on them, maybe deflecting an inch or so. Typically, I put the final cranks on them after stringing the fencing wire (so the forces are in opposition). If your H-brace isn’t holding a fence, you should be able to put enough tension on the wires that they pull the posts out of plumb long before the wire breaks.